For some families, the four legged family members sit in a place of honor. These adorable, furry friends are pampered with the finest items that money can buy. From frilly dresses to elegant suits, dogs and cats are fashion forward. Purex wants to make sure that these fashionable outfits look their best with Purex Fresh Pet Clothing Detergent. 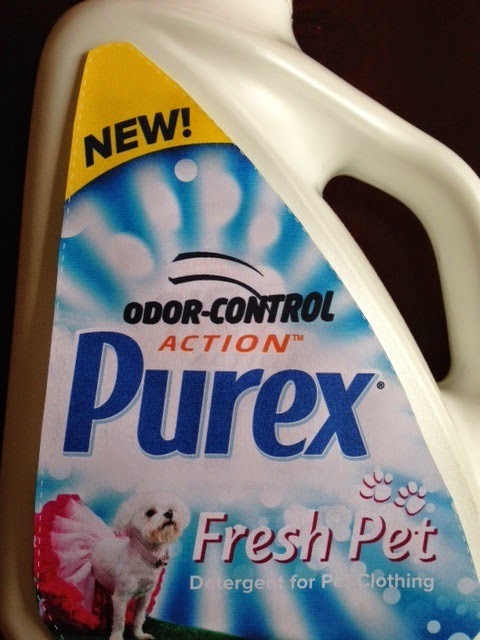 Purex Fresh Pet Clothing Detergent is the newest addition to the Purex line. This specially formulated detergent eliminates wet dog and smelly cat in a single wash.
Don't leave the furry family members out in the cold. Get their clothes fresh and clean with Purex Fresh Pet Clothing Detergent. Disclosure: APRIL FOOLS. I'm a Purex Insider. This post is an April Fools Day joke.